If you love the tasty of tangy and tart dishes with a smooth and velvety sauce, this recipe for chicken piccata with artichoke hearts is for you. The dish is one of my favorite 30 minute meals, but tastes as though you spent hours on it. It is made with pieces of chicken, dredged in a seasoned flour with artichoke hearts, lemon, white wine and tomatoes. This Italian classic has a sauce that is to die for. It is smooth and tart, but not overly tangy. 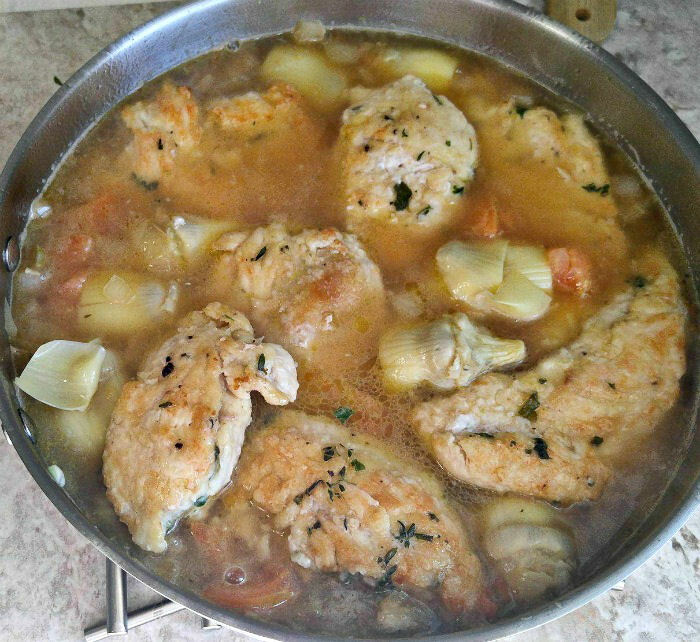 The white wine combines with the chicken stock and the juice from the artichokes to make a really flavorsome sauce. With a few adjustments (included below), the dish can also be eaten on a gluten free diet. My daughter worked as a waitress at Ragazzi’s Italian restaurant here in Raleigh, NC when she was in high school. Of course, my husband and I often used to dine there often, and one of his favorite dishes was their chicken piccata. Since he liked it so much I decided to come up with my version of it, and (even if I do say so myself), I think I prefer my version over the restaurant one! The flavor of this chicken piccata with artichoke hearts builds gently as you add one aromatic after another. 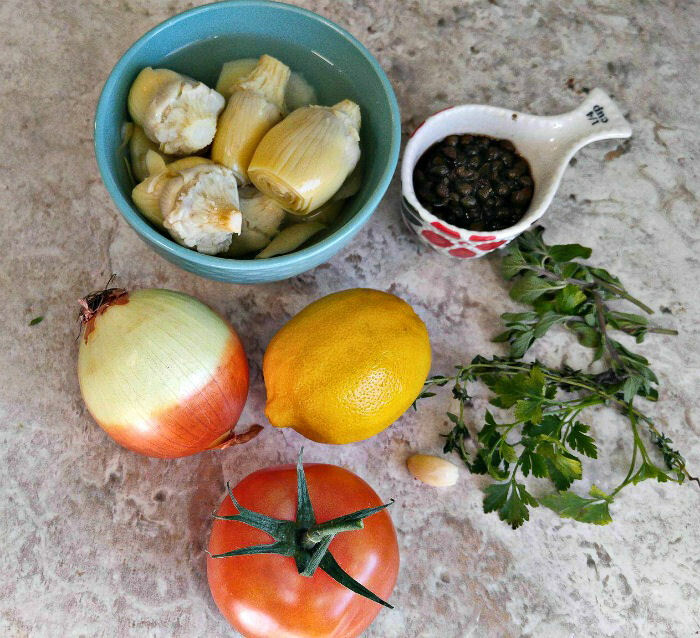 I loved the way the tomato, wine, capers and artichoke hearts combine. 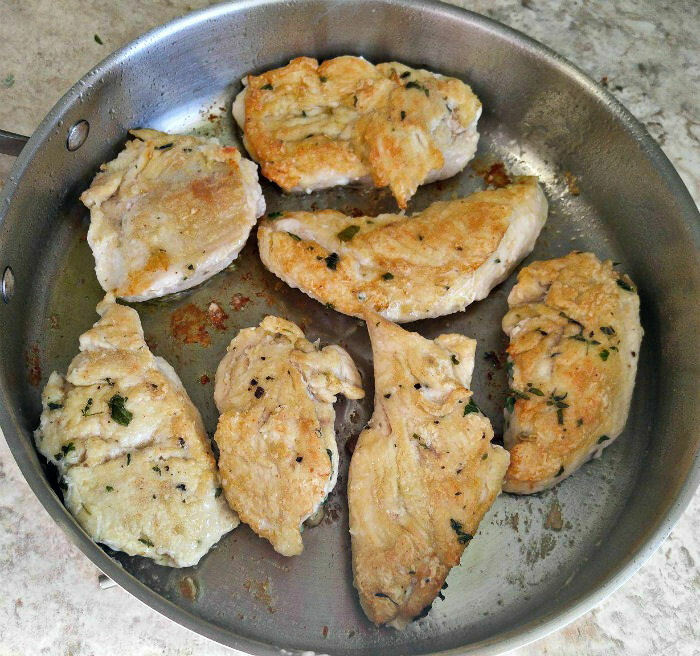 Heat the olive oil in a large sauté pan and cook the chicken pieces for a few minutes on each side until lightly browned. Set them aside and keep warm. 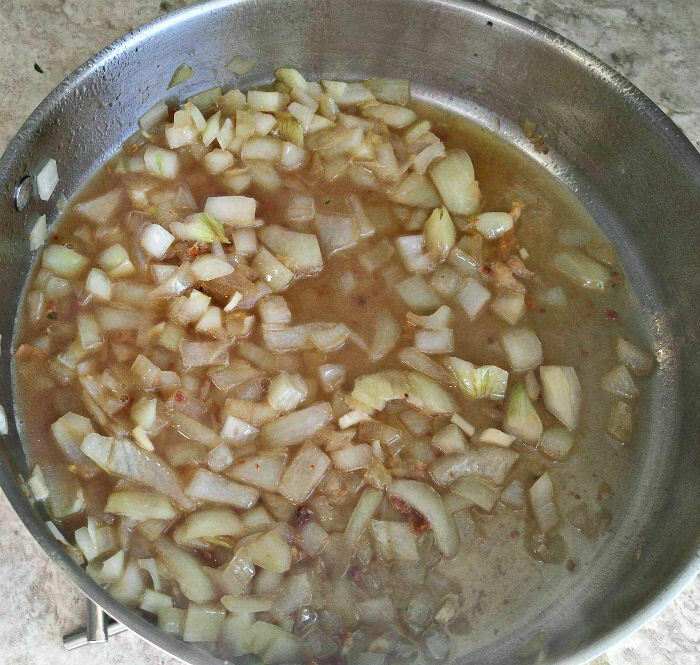 Use the same pan to cook the garlic and onions and then pour in the wine and scrape up all the crusty bits from the bottom of the pan. These will go a long way towards adding flavor to the sauce. Raise the heat and cook until the liquid reduces to about half. 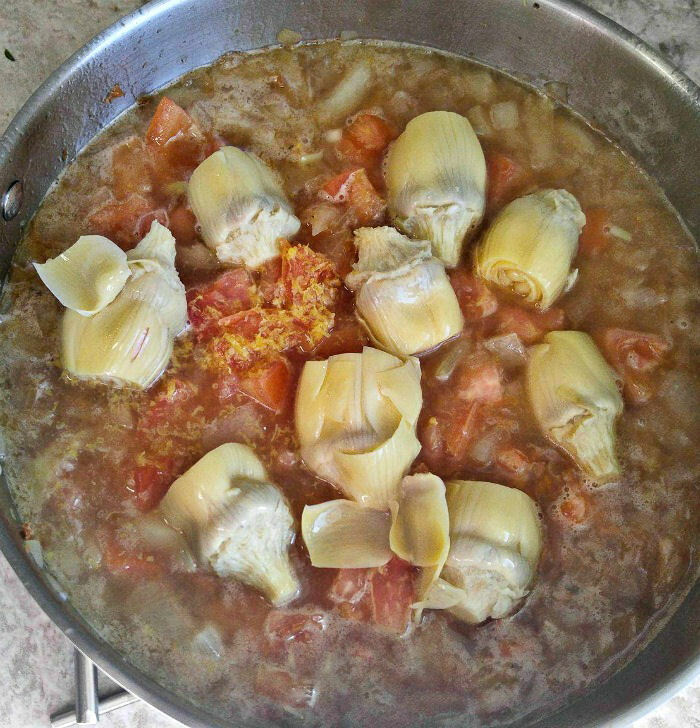 Pour in the chicken broth, lemon juice and zest, diced tomato and whole baby artichoke hearts along with their liquid. The sauce is starting to smell amazing! Stir to combine and add the chicken back to the pan. Reduce the heat and simmer for 20 minutes. The sauce will start to thicken but I like to also add some of the cooking liquid to a tablespoon of arrowroot powder and cold water to help thicken the sauce even more and give it a velvety finish. The final step in this chicken piccata with artichoke hearts is to stir in the butter and capers and gently cook till the sauce thickens. I like to use a bowl to serve this dish. I don’t want to miss any of the amazing sauce! That is what makes this dish something special! The recipe has such a wonderful flavor and is even better the next day! I am normally not a person who likes a lemon style of sauce. I normally find them too tart. But this recipe is not like that. It is slightly tangy but has so many other flavors that temper this to make it more of a savory taste. I just love it! The recipe makes four servings, each with 395 calories. It is gluten free (with my adjustments for the flour, and arrowroot) and is high in protein. Try it today. I’m sure you will love it as much as I do! 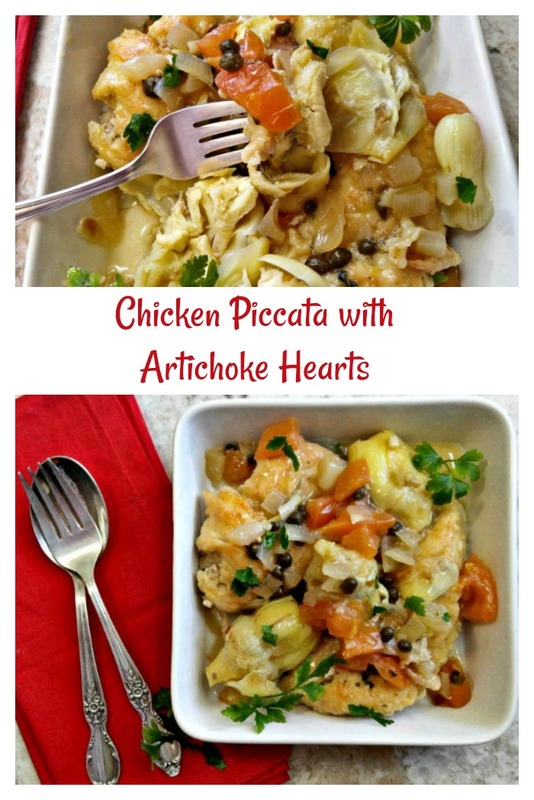 Looking for a reminder of this recipe for chicken piccata with artichoke hearts? Just pin this photo to one of your recipe boards on Pinterest. Admin note: This recipe first appeared on my blog in October 2013. I have updated the instructions to give gluten free adjustments and have taken more step by step photos to help you with the process of making this chicken piccata with artichoke hearts recipe. 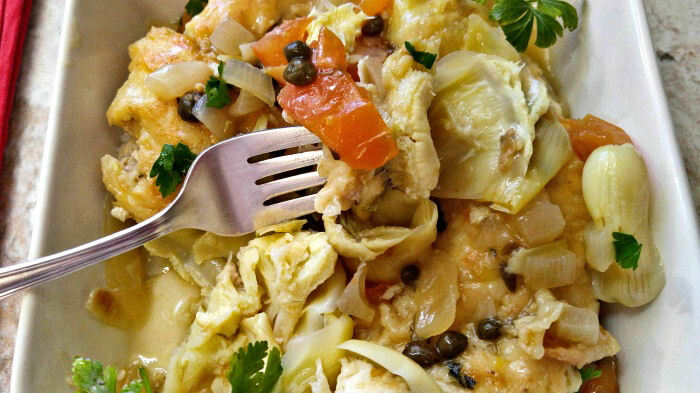 This chicken piccata recipe uses capers and artichoke hearts for a delicious Italian classic that is sure to become a family favorite. 1 tbsp arrowroot powder mixed with 2 tbsp water and 3 tbsp of the cooking liquid) to thicken the sauce. Mix together the flour, garlic powder, sea salt, black pepper, and fresh herbs. Dredge the chicken pieces lightly into the prepared flour mixture and set aside. Heat the olive oil in a large pan over medium-high heat. Cook the chicken pieces for 2 minutes on each side, or until nicely browned. Remove from the pan and keep warm. Using the same frying pan, cook the onion, and garlic until translucent, about 3 minutes. Pour the white wine into the pan, and scrape up the crusty bits on the bottom of the pan. Turn the heat to high, and cook until the wine reduces by half, about 4 minutes. Add the chicken broth, lemon juice and zest, diced tomato, artichoke hearts, reserved artichoke liquid, and browned chicken to the skillet. Reduce the heat to medium and cook until the sauce thickens, about 20 minutes. Combine the water with the arrowroot powder and stir in 3 tbsp of the cooking liquid. Add to the pan. Stir in the capers and butter and cook another minute or so till the sauce thickens. Hi Carol. I made this today for 12 ladies I am having over tomorrow evening. I tripled the recipe and poured the sauce all over the chicken in the baking dish. Hoping it warms up good. The sauce smelled delicious and there is a lot of it so tthe chicken should stay moist. 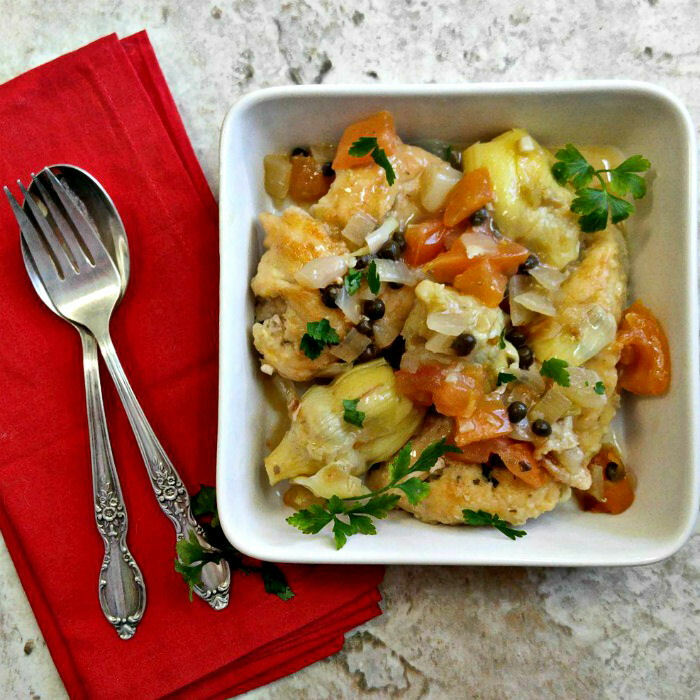 I love Michaelangelo’s frozen Chicken Piicatta, and this is similar but going to be sooo much better. Thanks for the recipe. Can this be made ahead and baked in the oven to warm up? Hi Linda. It could be done, but might result in the chicken being dry, unless you UNDER cooked the chicken for the recipe steps and then added it to the oven to finish cooking later. 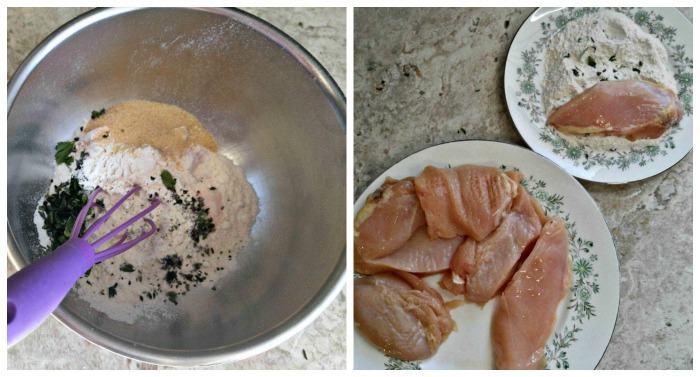 One of the best, if not THE best, Chicken Piccata recipes I have ever tried. I like how the sauce thickens and wondered if it was the artichoke juice that had this effect (?). Other fairly similar recipes did not include the artichoke juice. Thank you for a great dish.